Information about Aquadrive, P-brackets, shafts, propellers, rope cutters, etc. I am indebted to contributors to the YBW.com/PBO Reader to Reader forum for many of the photographs on the pages in this section..
A huge selection of photographs and links to stern gear components can be found here. 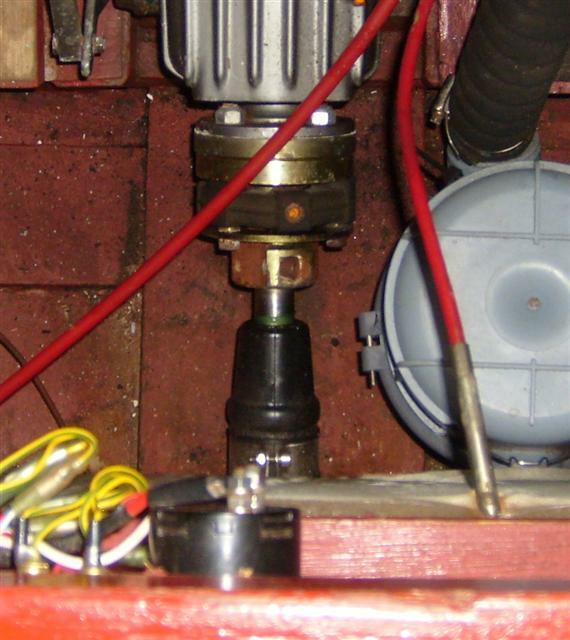 In older and larger boats engines are mounted solidly, with shafts directly coupled to the gearbox, requiring very accurate alignment to avoid bearing problems. 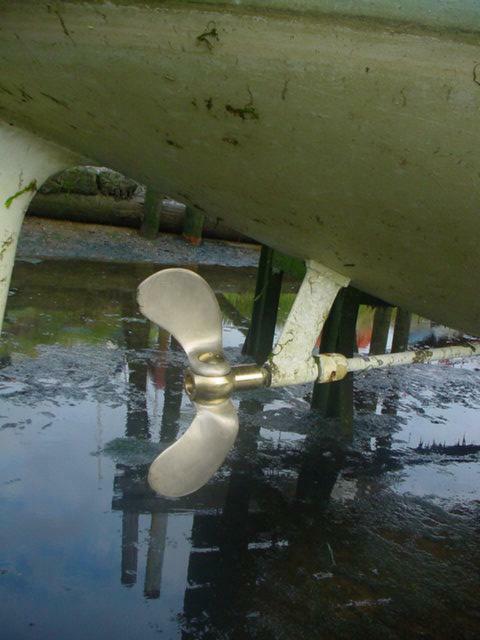 Shafts in these designs normally run in a stern tube with a bearing at each end installed in the solid deadwood ahead of the propeller. Noise levels with this type of installation can be high. Modern practice is to mount engines very flexibly to reduce levels of noise transmitted to the hull. Not only the engine but couplings between the gearbox and shaft, and the final drive bearing, may also be made of rubber or flexible in some other way. It is not just a matter of mounting everything on rubber though, a simple rule of thumb being that any two of engine mountings, coupling and stern gland may be flexible but not all three. 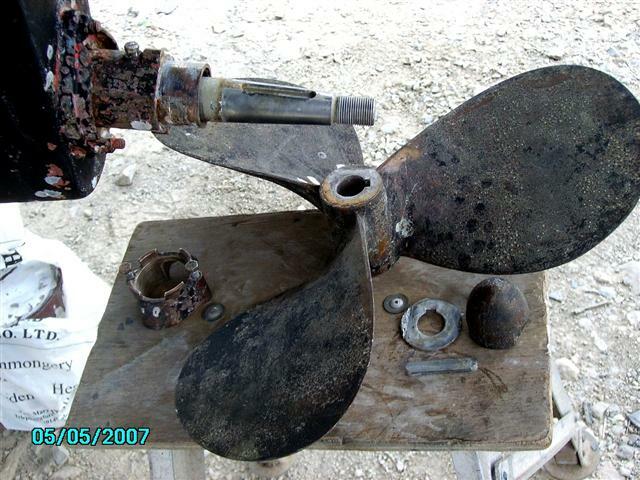 This arrangement is commonly seen in older boats. The shaft runs in two bearings, one at each end of the stern tube. In the diagram the bearings are water-lubricated with a conventional stern gland at the inboard end, rigidly bolted to the stern tube. 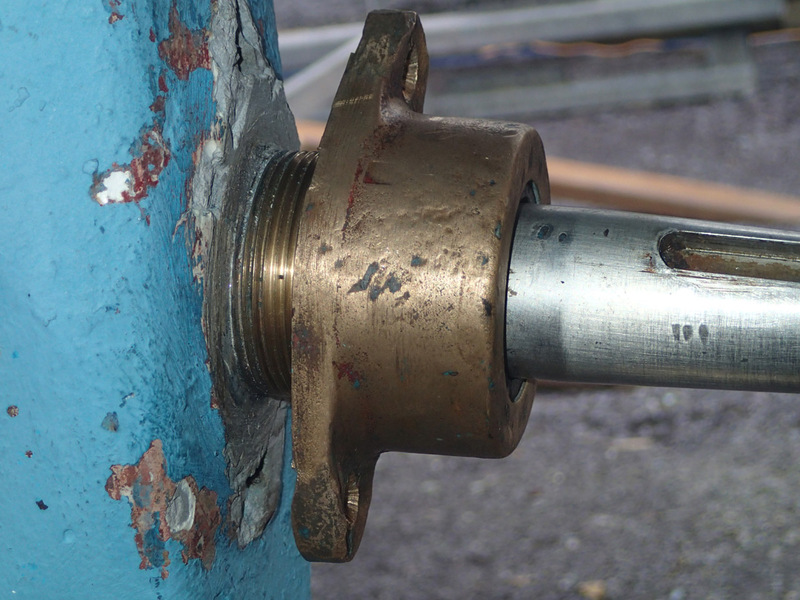 In some cases both bearings are grease lubricated.As shown, a flexible coupling is mounted on the gearbox to cater for large engine movements on flexible mountings. A common arrangement in more recent boats, particularly those fitted with a P-bracket, which carries the aft bearing. There is no bearing at the forward end, the shaft being free to move laterally to accommodate engine movement. 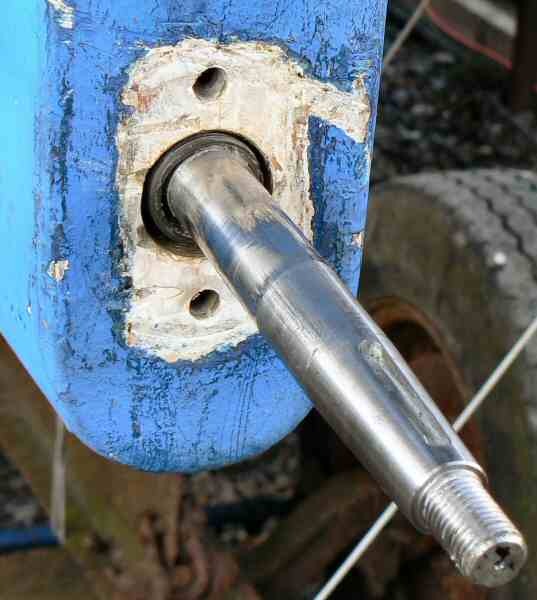 A rubber sleeve joins the gland to the stern tube. An interesting stern gear arrangement on an Eventide, originally fitted with a Stuart Turner engine. 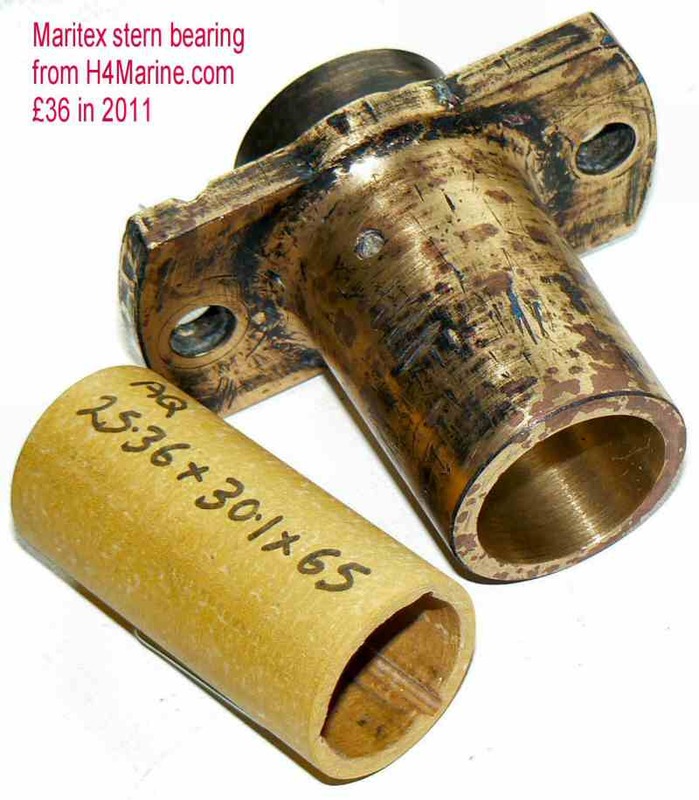 This was replaced some years ago by a soft-mounted Yanmar 1GM whose movement would have been excessive for a conventional flexibly mounted stern gland. 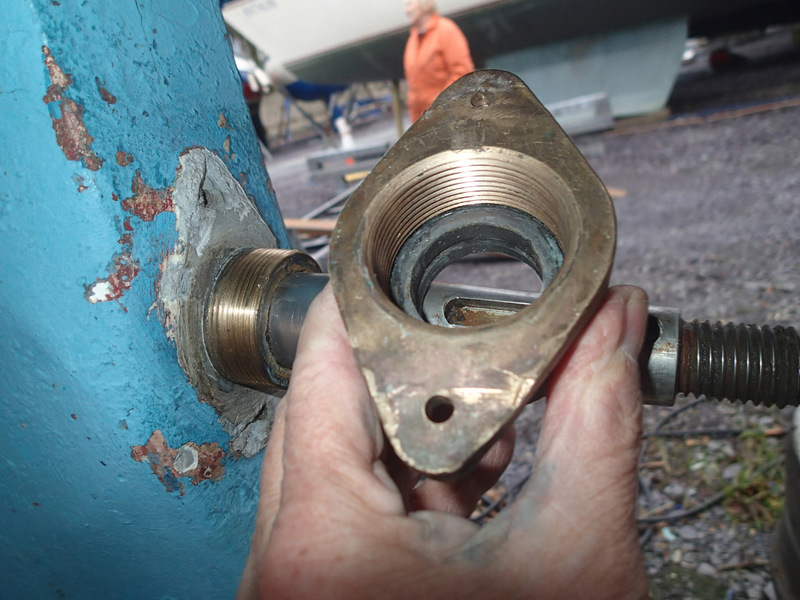 The solution was to replace the original white metal inner bearing in the stern tube with a length of cutless bearing, while machining the exterior of the old Stuart Turner stuffing box housing to fit a Volvo seal. Using this method the shaft is supported at both ends of the stern tube and the flexibly mounted engine is free to move, in conjunction with a Bullflex coupling. This arrangement worked extremely well for many years and was retained for a recent engine upgrade to a Nanni 14. 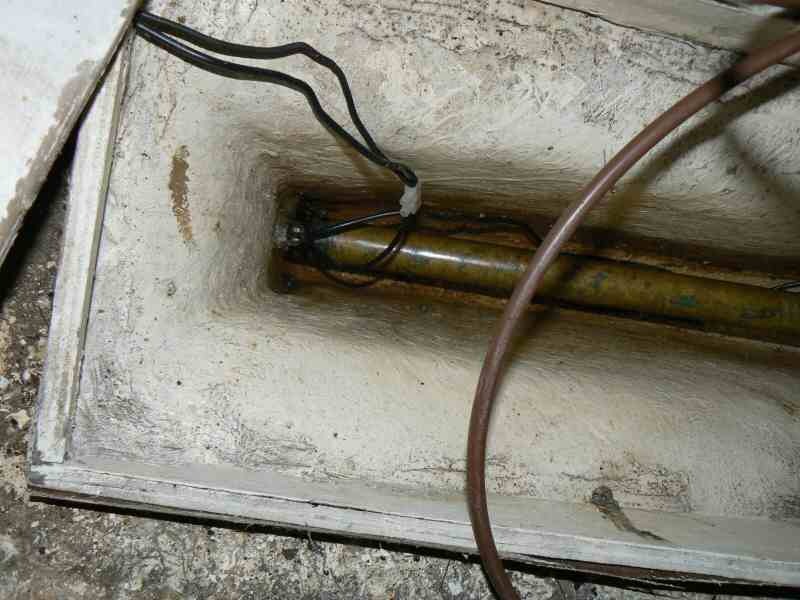 The previous shaft was a very close fit in the stern tube and obviously unsuitable for a flexibly mounted bearing/gland. The decision was made to revert to what she was built with and a new fixed bearing/gland was made by T.Norris Ltd, Isleworth. This bearing was white-metalled and bored to size by a firm in York at a very reasonable price. The problem of a flexibly mounted engine working with a rigidly mounted shaft, was addressed by fitting a Centaflex coupling. This may have been unnecessary with a BUKH DV10 engine, which is mounted on fairly stiff mounts and doesn’t move much at all. An Aquadrive was preferred but there was insufficient room. 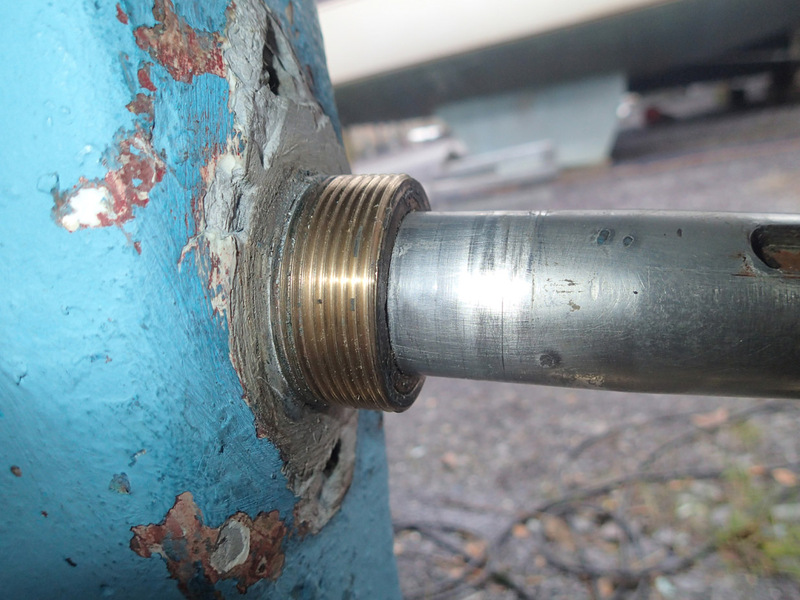 The only problem encountered in approximately 10 years was a slight leak along the threads where the bearing/gland screws onto the sterntube when the thread sealant began to deteriorate. 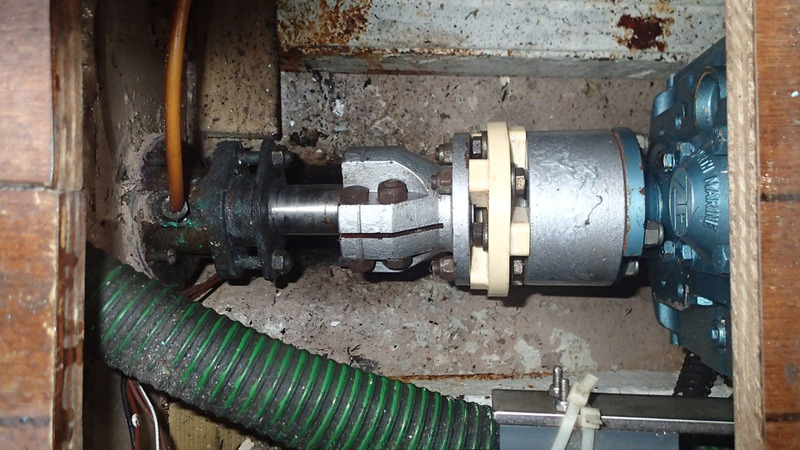 It was realised that greasing had been overdone to the extent that so much grease had been pumped into the sterntube that no cooling water could get near the inboard bearing/gland. This caused the bearing to get hot and spoil the thread sealant. Grease use is now minimal, the bearing runs cool and water ingress is minimal. Aft bearing arrangement on ‘Lady in Red’, the shaft running in two bearings within the stern tube. 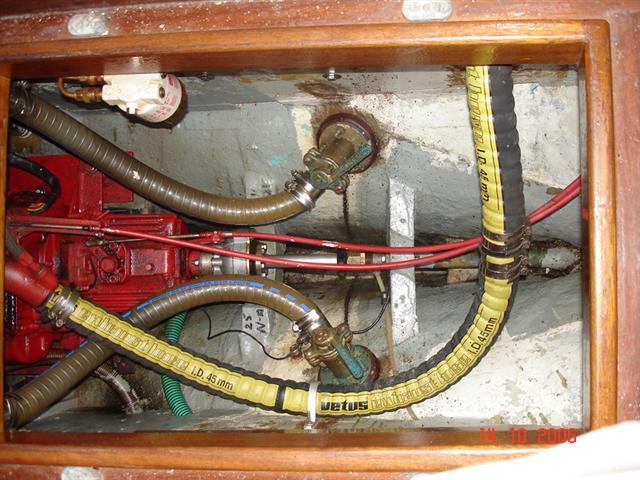 There is no necessity to disconnect the stern tube with this well-engineered design. Removing the aft part of the fitting exposes about 2 inches of the bearing which can then be gripped for removal. The bearing is locked in place with the screw that can be seen on top of the bearing housing. Bruntons Autoprop brand new, installation before fitting its anode. A simple change of propeller, but the shaft taper and thread dimensions must be supplied to Bruntons beforehand, as a special nut accompanies the propeller. Nut heads inside the shaft tunnel, difficult access. Anode wires attached. Very long socket extensions needed to remove and replace the lower nut. 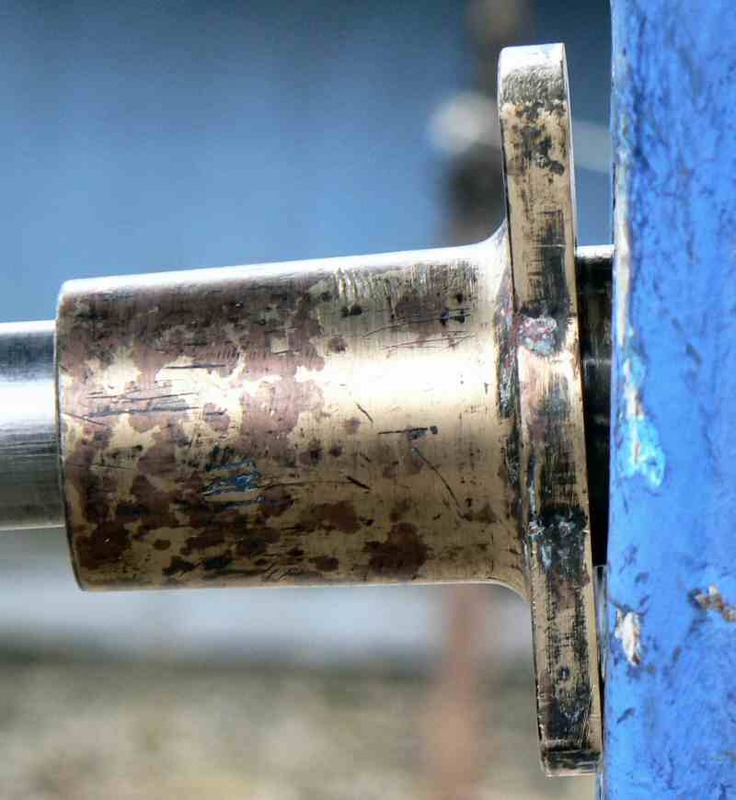 The bronze stern tube is threaded on the outside and it screws into the bearing holder. The bearing holder is bolted onto the deadwood. Photo shows the externally threaded tube after removal of the bearing carrier. Two shots of the bearing carrier with the worn white metal bearing. The white metal was machined out. Maritex non-metallic bearing ready to fit. Epoxy is used to bed the bearing inside the tube. A tapered teak pad, epoxied for protection, was made to provide a good fit. Refitted with the bearing epoxied in and left slightly proud to ease removal next time, the epoxy can be softened with heat. Thread and everything else bedded on CT1 mastic. 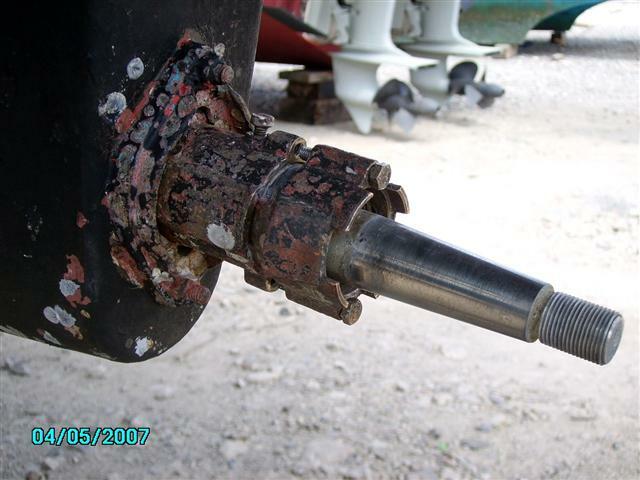 The stern tube is externally threaded, with the bearing inside it. The original bearing was white metal, the outer 15 mm of larger diameter being retained by the screwed cap. The white metal inside the tube was replaced with Vesconite. The outer 15 mm was cut from the original bearing as a retainer for the Vesconite bearing, which was also epoxied into the tube. 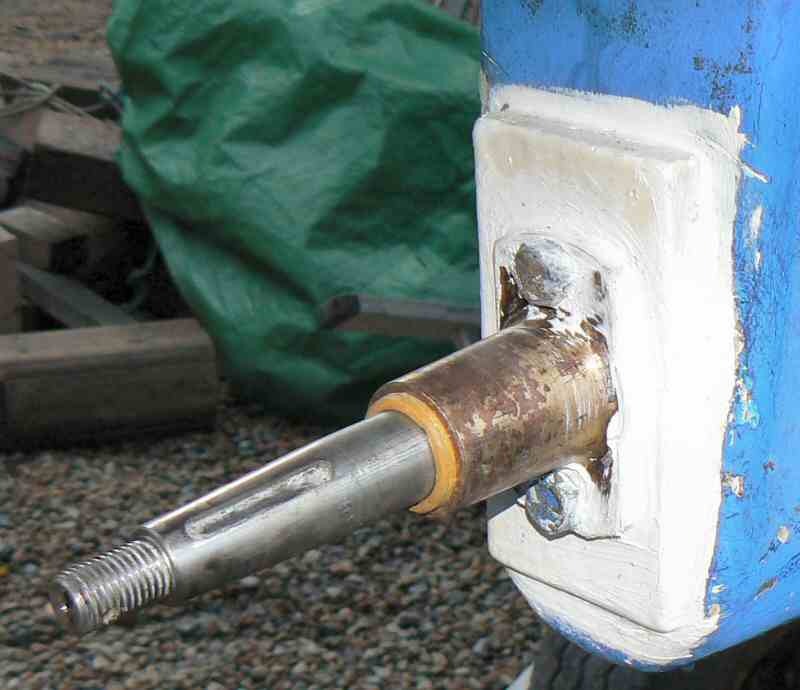 Screwed bearing retainer partly tightened onto the stern tube.